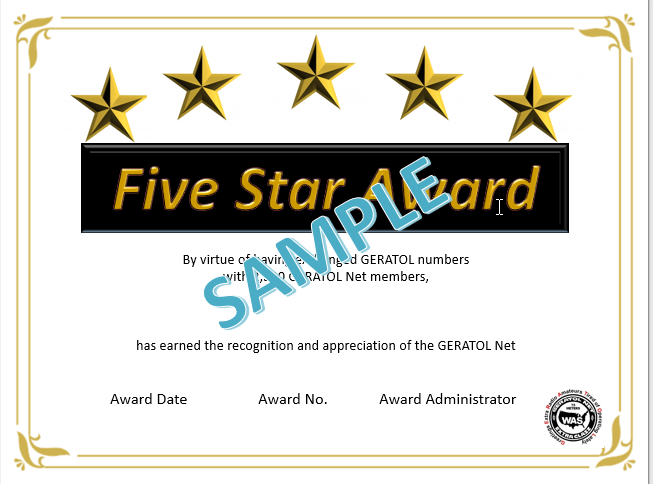 The GERATOL Net Board approved the new GERATOL Net 5 Star Award at the last Board meeting 10/30/2018. There are many Old Timers that are close to achieving this award and it is our hope that it will spur them on to get on the Net. It also provides the ultimate challenge to all Members to keep them coming back to the Net. The rules for this award are below. Exchange GERATOL numbers with 2500 stations. 1. A GERATOL number is required before working this award. 3. All contacts must be after 01:00 November 1, 1972. 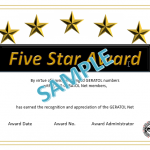 NOTE: The contact date on this award is changed in order to provide for Old Timers contacts that have been on and supported the GERATOL Net since it’s inception. However, the award is open to any member that holds a GERATOL number. This award is effective on Oct. 31 at 01:00 2018.